Dawn Oates with daughter Harper, 2, at Brookline Avenue Playground. Four-year-old twins Jack and Olivia Oates were having so much fun at day camp this summer that one afternoon when their 2½-year-old sister, Harper, showed up with their mother at pickup time, they asked to give the toddler a tour. It was a heartbreaking moment for the Brookline mother, but it was also a feeling that she has become accustomed to ever since Harper was born with incomplete quadriplegia, which causes paralysis in her legs and in parts of her arms and hands. Nonetheless, Dawn Oates isn’t one to silently lament her daughter’s limitations. Instead, she has set about to make changes — changes that may begin in Harper’s immediate world, but have the potential to reach far beyond. Oates is establishing a nonprofit organization, the Play Brigade, whose mission is to make playgrounds more accessible for children like Harper. As Oates points out, the same accommodations for youngsters in wheelchairs will also benefit children and adults with other limitations, ranging from conditions on the autism spectrum to pregnancy, joint or back problems, and postsurgical recovery. When Harper was born in December 2011, her parents were devastated to learn of her physical disabilities. According to Oates, the child’s entire first year was consumed with hospitalizations, medical discussions, and heart-rending decisions affecting her future. But soon after Harper’s first birthday, Oates and her husband, Justin, experienced a moment of awakening. More than anything, Oates believed, her daughter needed to be able to play. The Oates hired Erin Connelly, a child-life specialist whose role involves helping Harper to play, learn, and interact with her siblings in positive and developmentally appropriate ways. When Connelly inquired about taking Harper to one of the town’s playgrounds within walking distance of the family’s Chestnut Hill home, Dawn Oates contacted Brookline’s Parks and Open Space Department to ask about special equipment for children with disabilities, and was assured that each playground already had or would soon have a five-point harness “bucket swing,” considered the norm for children with disabilities. Instead, Oates dreams of local playgrounds having the kind of equipment she’s found through extensive research, some of which she has seen firsthand at the state-of-the-art Thomas M. Menino Park in Charlestown, which is frequently visited by patients at the adjacent Spaulding Rehabilitation Hospital. Its equipment includes merry-go-rounds that children in wheelchairs and fully mobile children can whirl around on together, and slides that can be accessed by a gently sloping ramp rather than a staircase or ladder. As Oates discussed her ideas with Parks and Open Space Department employees, they offered her a position on the Design Review Committee for the Brookline Avenue Playground, which is slated to undergo a complete renovation in the near future. She readily accepted the role, eager to take on a position of leadership in her mission, but eventually discovered her vision for a fully accessible facility would cost about $1 million. “There are plenty of people I can ask for donations of 25, 50, 100 dollars, but how am I going to raise a million?” she remembers asking her husband. Together, they realized the answer was to start their own nonprofit foundation. Until governmental approval is complete for the Play Brigade to be a freestanding entity, the MOMS Club of Brookline has agreed to adopt it as its philanthropic mission, meaning that charitable fund-raising, eligible for tax-deductible donations, can begin right away. “Ultimately, this is about so much more than just raising money to build a different kind of playground,” Oates said. “The ADA created a code that protects people with disabilities. But there’s law, and then there’s what we can all do together to go far beyond what’s required. “Here in Greater Boston, we’re full of new ideas, creativity, and entrepreneurship. We’ve always been ahead in terms of science, technology, and medicine, and we are prideful of how we treat our children. 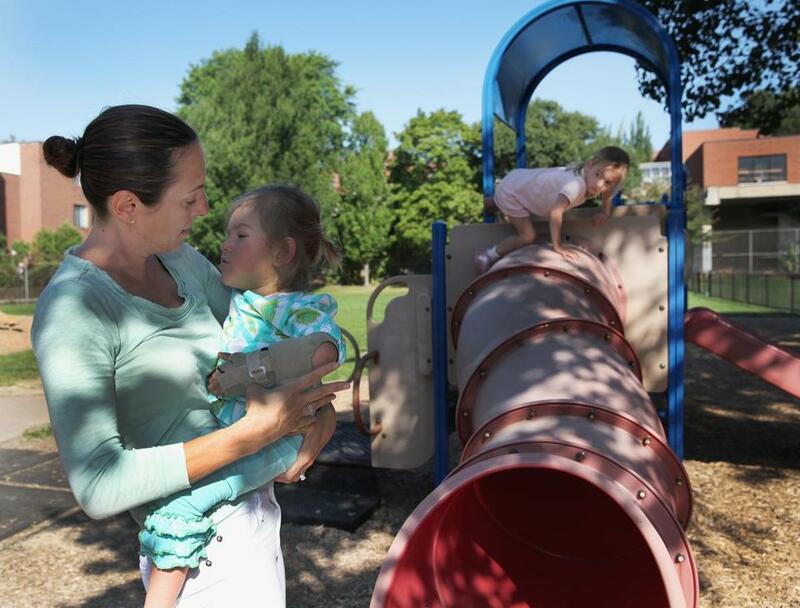 I’m not asking for a special playground with special things for kids with special needs, I’m asking for us to think and make choices so that every person in the community feels that they can participate in a park built to accommodate them,” Oates said. Dawn Oates and Harper, 2, watch Olivia, 4, on the swings at Brookline Avenue Playground. For Harper, a swing with seats and harnesses would allow her to sit alone. Tax-deductible donations to the Play Brigade may be made through www. gofundme.com/ playbrigade.